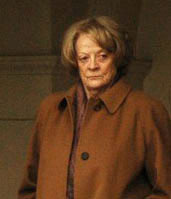 Dame Margaret Natalie "Maggie" Smith, CH, DBE (born 28 December 1934) is an Inglis actress. She haes haed an extensive, varied career in stage, film an televeesion spannin ower saxty years. Smith haes appeared in ower 50 films an is ane o Breetain's maist recognisable actresses. She wis appyntit as Commander o the Order o the Breetish Empire (CBE) in 1970. She wis appyntit Dame Commander o the Order o the Breetish Empire (DBE) in the 1990 New Year Honours for services tae the performin airts, an Member o the Order o the Companions o Honour (CH) in the 2014 Birthday Honours for services tae drama. ↑ "Person Details for Margaret N. Smith, "England and Wales Birth Registration Index, 1837-2008"". FamilySearch.org. ↑ Mackenzie, Suzie (20 November 2004). "You have to laugh". The Guardian. UK. Retrieved 10 December 2007. ↑ Enfield, Laura (18 November 2015). "Ilford born Maggie Smith talks about starring in The Lady in the Van". The Tottenham Independent. Retrieved 16 June 2016. ↑ "Orders and decorations conferred by the crown". Debrett's. Retrieved 4 January 2015. ↑ Spears, W. (30 December 1989). "Queen Honors Naipaul, Maggie Smith". Philly.com. Retrieved 1 January 2014. ↑ "No. 60895". The London Gazette (Supplement). 14 June 2014. p. b5.